Pent-roof combustion chamber enables optimal intake and exhaust valve placement for maximum engine performance and efficiency. 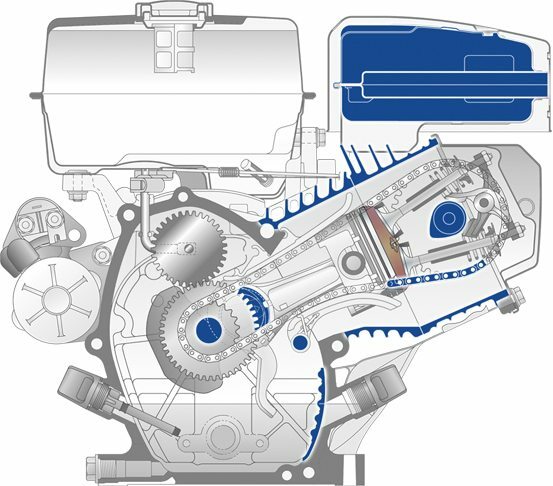 Heavy-duty piston rings, a cast iron cylinder liner and a case-hardened-steel timing chain resist wear and ensure precise timing for long engine life. The all-season model produces 35 percent less vibration than competitive models, which extends the life of the equipment it powers and enhances operator comfort. An optimized-capacity rigid muffler and fewer moving valve train parts than overhead valve designs equate to noise levels that are a full two decibels below competitive models. The chain-driven overhead cam design offers superior power and performance with an automatic decompression system to reduce the required pulling force by 30-40 percent. Features 33 percent fewer moving valve train parts than overhead valve designs. First pull starts without any perceptible kickback. An all-season model takes on changing seasons, starting even when it’s -20 degrees Fahrenheit (-29 C). A straight intake port reduces resistance to the flow of the air/fuel mixture to improve power and efficiency and reduce emissions. We lead the way in customer service too. And our warranty policy is no exception. 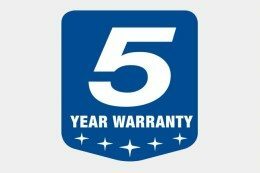 EX Series is covered by Subaru’s 5-year limited warranty. Enjoy a guaranteed, hassle-free claim process, where all “ties” go to the customer. We believe it’s about more than just superior engines – it’s investing in superior service and peace of mind.